NEW ORLEANS – Scholar Teams of the Year and All-Academic Team honors for the 2017-18 NCAA Division II Indoor and Outdoor Track & Field seasons were announced by the U.S. Track & Field and Cross Country Coaches Association (USTFCCCA) on Thursday. The two indoor national champions on the men’s and women’s side took care of business in the classroom like they did on the track as the men from Pittsburg State and women from West Texas A&M were honored as the top scholar teams from the indoor season. For outdoors, the men’s program of Ashland and the women’s unit from Saint Augustine’s took the top spot. In order to be considered for Scholar Team of the Year, a program must finish highly at the national championships meet and have at least a 3.00 cumulative team GPA. 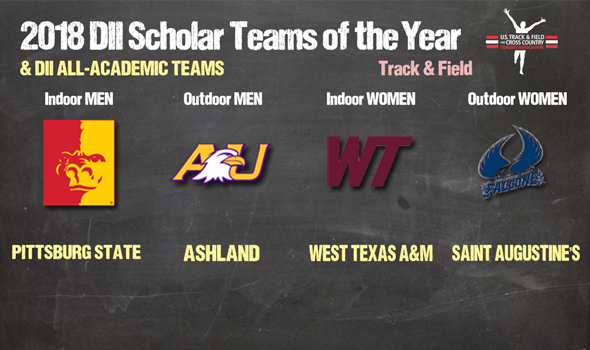 Pittsburg State and West Texas A&M are first-time winners of the Men’s and Women’s Indoor Scholar Team of the Year. Both teams won their respective NCAA Division II Indoor National Championship and kept their strong performances going in the classroom as the Pittsburg State men registered a 3.10 team GPA while the West Texas A&M women recorded a 3.24. The Ashland men were honored with their fourth Outdoor Scholar Team of the Year in program history, the most in Division II. The program finished in second place as a team at the 2018 NCAA Division II Track & Field Championships and posted a team GPA of 3.06. Saint Augustine’s joined Pittsburg State and West Texas A&M in collecting the program’s first Outdoor Scholar Team of the Year honors. The Falcon women finished as the runner-up at the 2018 NCAA Division II Track & Field Championships and posted a team GPA of 3.26. In total, 216 teams were honored for their academic performance by the USTFCCCA. Breaking it down further, 132 of those were women’s teams compared to 84 men’s programs. The highest cumulative GPA of any team belonged to the Cedarville University women who maintained a team GPA of 3.61 under head coach Jeff Bolender. On the men’s side, Walsh University took the top spot with a team GPA of 3.47 under head coach Rob Mizicko. See below for a full list of All-Academic Teams in NCAA Division II Track & Field.